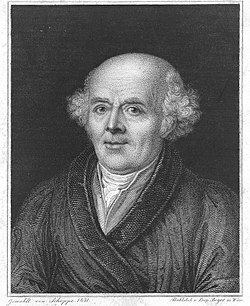 Christian Friedrich Samuel Hahnemann (German: [ˈhaːnəman]; 10 April 1755 – 2 July 1843) was a German physician, best known for creating the pseudoscientific system of alternative medicine called homeopathy. Christian Friedrich Samuel Hahnemann was born in Meissen, Saxony, near Dresden. His father Christian Gottfried Hahnemann  was a painter and designer of porcelain, for which the town of Meissen is famous. As a young man, Hahnemann became proficient in a number of languages, including English, French, Italian, Greek and Latin. He eventually made a living as a translator and teacher of languages, gaining further proficiency in “Arabic, Syriac, Chaldaic and Hebrew“. In 1781, Hahnemann took a village doctor’s position in the copper-mining area of Mansfeld, Saxony. He soon married Johanna Henriette Kuchler and would eventually have eleven children. After abandoning medical practice, and while working as a translator of scientific and medical textbooks, Hahnemann travelled around Saxony for many years, staying in many different towns and villages for varying lengths of time, never living far from the River Elbe and settling at different times in Dresden, Torgau, Leipzig and Köthen (Anhalt) before finally moving to Paris in June 1835. My sense of duty would not easily allow me to treat the unknown pathological state of my suffering brethren with these unknown medicines. The thought of becoming in this way a murderer or malefactor towards the life of my fellow human beings was most terrible to me, so terrible and disturbing that I wholly gave up my practice in the first years of my married life and occupied myself solely with chemistry and writing. After giving up his practice around 1784, Hahnemann made his living chiefly as a writer and translator, while resolving also to investigate the causes of medicine’s alleged errors. While translating William Cullen‘s A Treatise on the Materia Medica, Hahnemann encountered the claim that cinchona, the bark of a Peruvian tree, was effective in treating malaria because of its astringency. Hahnemann believed that other astringent substances are not effective against malaria and began to research cinchona’s effect on the human body by self-application. Noting that the drug induced malaria-like symptoms in himself, he concluded that it would do so in any healthy individual. This led him to postulate a healing principle: “that which can produce a set of symptoms in a healthy individual, can treat a sick individual who is manifesting a similar set of symptoms.” This principle, like cures like, became the basis for an approach to medicine which he gave the name homeopathy. He first used the term homeopathy in his essay Indications of the Homeopathic Employment of Medicines in Ordinary Practice, published in Hufeland‘s Journal in 1807. Following up the work of the Viennese physician Anton von Störck, Hahnemann tested substances for the effects they produced on a healthy individual, presupposing (as von Störck had claimed) that they may heal the same ills that they caused. His researches led him to agree with von Störck that the toxic effects of ingested substances are often broadly parallel to certain disease states, and his exploration of historical cases of poisoning in the medical literature further implied a more generalised medicinal “law of similars”. He later devised methods of diluting the drugs he was testing in order to mitigate their toxic effects. He claimed that these dilutions, when prepared according to his technique of “potentization” using dilution and succussion (vigorous shaking), were still effective in alleviating the same symptoms in the sick. His more systematic experiments with dose reduction really commenced around 1800–01 when, on the basis of his “law of similars,” he had begun using Ipecacuanha for the treatment of coughs and Belladonna for scarlet fever. Bust of Samuel Hahnemann by French sculptor David d’Angers (1837). Around the start of the nineteenth century Hahnemann developed a theory, propounded in his 1803 essay On the Effects of Coffee from Original Observations, that many diseases are caused by coffee. Hahnemann later abandoned the coffee theory in favour of the theory that disease is caused by Psora, but it has been noted that the list of conditions Hahnemann attributed to coffee was similar to his list of conditions caused by Psora. Samuel Hahnemann Monument at Scott Circle, Washington, D.C. In early 1811 Hahnemann moved his family back to Leipzig with the intention of teaching his new medical system at the University of Leipzig. As required by the university statutes, to become a faculty member he was required to submit and defend a thesis on a medical topic of his choice. On 26 June 1812, Hahnemann presented a Latin thesis, entitled “A Medical Historical Dissertation on the Helleborism of the Ancients.” His thesis very thoroughly examined the historical literature and sought to differentiate between the ancient use of Helleborus niger, or black hellebore, and the medicinal uses of the “white hellebore”, botanically Veratrum album, both of which are poisonous plants. Hahnemann continued practicing and researching homeopathy, as well as writing and lecturing for the rest of his life. He died in 1843 in Paris, at 88 years of age, and is entombed in a mausoleum at Paris’s Père Lachaise Cemetery. There are a few living descendants of Hahnemann’s older sister Charlotte (1752–1812),[self-published source?] but the living descendants of Hahnemann himself derive from one of his daughters. Hahnemann’s daughter, Amelie (1789–1881), had a son: Leopold Suss-Hahnemann. Leopold emigrated to England, and he practised homeopathy in London. He retired to the Isle of Wight and died there at the outbreak of World War I in 1914. Dr Leopold Suss-Hahnemann’s youngest daughter, Amalia, had two children, Winifred (born in 1898) and Herbert. William Herbert Tankard-Hahnemann (1922–2009) was Winifred’s son. He served as a Major in the British Army during World War II, and then had a career in the city of London. He was at one point appointed as a Freeman of the City of London. Mr William Herbert Tankard-Hahnemann, the great-great-great-grandson of Samuel Hahnemann died on 12 January 2009 (his 87th birthday) after 22 years of active patronage of the British Institute of Homeopathy. The William Tankard-Hahnemann line continues with his son, Charles. Versuch über ein neues Prinzip zur Auffindung der Heilkräfte der Arzneisubstanzen, nebst einigen Blicken auf die bisherigen [Essay on a New Principle for Ascertaining the Curative Powers of Drugs] (in German). 1796. reprinted in Versuch über ein neues Prinzip zur Auffindung der Heilkräfte der Arzneisubstanzen, nebst einigen Blicken auf die bisherigen. Haug. 1988. ISBN 3-7760-1060-6. Fragmenta de viribus medicamentorum positivis sive in sano corpore humano obeservitis, a collection of 27 drug “provings” published in Latin in 1805. The Organon of the Healing Art (1810), a detailed delineation of what he saw as the rationale underpinning homeopathic medicine, and guidelines for practice. Hahnemann published the 5th edition in 1833; a revised draft of this (1842) was discovered after Hahnemann’s death and finally published as the 6th edition in 1921. Materia Medica Pura, a compilation of “homoeopathic proving” reports, published in six volumes between vol. I in 1811 and vol. VI in 1827. Revised editions of volumes I and II were published in 1830 and 1833, respectively. Chronic Diseases (1828), an explanation of the root and cure of chronic disease according to the theory of miasms, together with a compilation of “homoeopathic proving” reports, published in five volumes during the 1830s. Appeal to Thinking Philanthropist Respecting the Mode of Propagation of the Asiatic Choler, in which Hahnemann describes cholera physicians and nurses as the “certain and frequent propagators” of cholera and that whilst deriding nurses’ “fumigations with chlorine”, promoted the use of “drops of camphorated spirit” as a cure for the disease. Hahnemann also campaigned for the humane treatment of the insane in 1792. ^ Though some sources do state that he was born in the early hours of 11 April 1755, Haehl, Richard (1922). Samuel Hahnemann his Life and Works. 1. p. 9. Hahnemann, was born on 10 April at approximately twelve o’clock midnight. ^ Ladyman J (2013). “Chapter 3: Towards a Demarcation of Science from Pseudoscience”. In Pigliucci M, Boudry M (eds.). Philosophy of Pseudoscience: Reconsidering the Demarcation Problem. University of Chicago Press. pp. 48–49. ISBN 978-0-226-05196-3. Yet homeopathy is a paradigmatic example of pseudoscience. It is neither simply bad science nor science fraud, but rather profoundly departs from scientific method and theories while being described as scientific by some of its adherents (often sincerely). Coulter, Harris Livermore (1977). Divided Legacy, a History of the Schism in Medical Thought. II. Washington: Wehawken Books. p. 306. ISBN 0-916386-02-3. OCLC 67493911. “Hahnemann Biography”. Retrieved 13 January 2009. Martin Kaufman (1972). Homeopathy in America, the Rise and Fall of a Medical Heresy. Baltimore: Johns Hopkins University Press. p. 24. ISBN 0-8018-1238-0. OCLC 264319. ^ Haehl, vol. 1, p. 24. Richard Haehl (1922). Samuel Hahnemann His Life and Work. 2. London: Homoeopathic Publishing. p. 11. OCLC 14558215. ^ Haehl, vol. 1, p. 26. ^ Gumpert, Martin (1945) Hahnemann: The Adventurous Career of a Medical Rebel, New York: Fischer, p. 130. ^ Sixth Organon book review Archived 21 October 2010 at the Wayback Machine. Minimum.com. Retrieved on 16 May 2012. ^ Dudgeon, R. E. (1853) Lectures on the Theory and Practice of Homeopathy, London: Henry Turner, p. xxxi. ^ Hahnemann S (1803): On the Effects of Coffee from Original Observations, in Hahnemann S., Dudgeon R. E. (ed) (1852): The Lesser Writings of Samuel Hahnemann. New York: William Radde, p. 391. ^ Haehl, Vol. 2, p. 96. ^ Robert Séror. “La famille du Docteur Samuel Frédéric Christian Hahnemann” (in French). Homeoint.org. Retrieved 16 May 2012. ^ “William Herbert Tankard-Hahnemann“. hpathy.com. 2009. Archived from the original on 13 November 2010. Fragmenta de viribus medicamentorum positivis, sive in sano corpore humano observatis (in Latin). 1824. OCLC 14852975. ^ ‘'Fragmenta de viribus’' and ‘'Materia Medica Pura’' full-text in French. Homeoint.org. Retrieved on 16 May 2012. ^ Online etext of Hahnemann’s Organon der Heilkunst. ^ Organon of Homeopathy, 6th version Archived 29 April 2007 at the Wayback Machine English version, full text online; German original (other format); English translation. Homeopathyhome.com. Retrieved on 16 May 2012. ^ Hahnemann’s Materia Medica Pura full-text in English Archived 17 May 2008 at the Wayback Machine. hpathy.com. Retrieved on 16 May 2012. ^ Rothstein, William G. (1992). American physicians in the nineteenth century: from sects to science. Baltimore: Johns Hopkins University Press. p. 158. ISBN 978-0-8018-4427-0. Hahnemann, Samuel (1792). The Friend of Health. Hahnemann, Samuel (1831). Appeal to thinking philanthropist respecting the mode of propagation of the Asiatic choler. The lesser writings of Samuel Hahnemann. pp. 753–763. OCLC 3440881. Hahnemann, Samuel (1796). Description of Klockenbring During his Insanity. The lesser writings of Samuel Hahnemann. pp. 243–249. OCLC 3440881. ^ John Henry Clarke (1894). Homoeopathy: all about it; or, The principle of cure. London: Homoeopathic Publishing. OCLC 29160937. ^ Haehl, Vol. 1, p. 34. Bradford, Thomas Lindsley (1999) . The Life and Letters of Samuel Hahnemann. Philadelphia: Boericke & Tafel. OCLC 1489955. Cook, Trevor (1981). Samuel Hahnemann Founder of Homeopathy. Wellingborough, Northamptonshire: Thorsons. ISBN 0-7225-0689-9. Brockmeyer, Bettina (2007). “Representations of illness in letters addressed to Samuel Hahnemann: gender and historical perspectives”. Medizin, Gesellschaft, und Geschichte : Jahrbuch des Instituts für Geschichte der Medizin der Robert Bosch Stiftung (in German). 29: 211–221, 259. PMID 18354994. Kayne, Steven (2006). “Samuel Hahnemann (1755–1843): the founder of modern homeopathy”. Pharmaceutical historian. 36 (2 Suppl): S23–6. PMID 17153748. Brockmeyer, Bettina (2005). “Writing about oneself and others: men and women in letters to doctor Samuel Hahnemann 1831–1835”. Würzburger medizinhistorische Mitteilungen / im Auftrage der Würzburger medizinhistorischen Gesellschaft und in Verbindung mit dem Institut für Geschichte der Medizin der Universität Würzburg (in German). 24: 18–28. PMID 17153289. “Biographic synopsis on Samuel Hahnemann”. Revista de enfermería (Barcelona, Spain) (in Spanish). 28 (3): 10–16. 2005. PMID 15871338. Eschenbruch, Nicholas (2005). “Rationalist, magician, scharlatan? Samuel Hahnemann and homeopathy from the viewpoint of homeopathy”. Schweiz. Rundsch. Med. Prax. (in German). 94 (11): 443–446. PMID 15822443. Jutte, R. (1999). ““Thus it passes from the patient’s purse into that of the doctor without causing displeasure” – Samuel Hahnemann and medical fees”. Medizin, Gesellschaft, und Geschichte : Jahrbuch des Instituts für Geschichte der Medizin der Robert Bosch Stiftung (in German). 18: 149–167. PMID 11624613.
de Goeij, C. M. (1994). “Samuel Hahnemann: an indignant systems builder”. Nederlands tijdschrift voor geneeskunde (in Dutch). 138 (6): 310–314. PMID 8121514. Rizza, E. (1994). “Samuel Hahnemann: a mystical empiricist. A study of the origin and development of the homeopathic medical system”. Medicina nei secoli (in Italian). 6 (3): 515–524. PMID 11620590. Meissner, M. (1992). “Samuel Hahnemann—the originator of homeopathic medicine”. Krankenpflege Journal. 30 (7–8): 364–366. PMID 1405462. Schmidt, J. M. (1988). “The publications of Samuel Hahnemann”. Sudhoffs Archiv. 72 (1): 14–36. PMID 2970128. Lozowski, J. (1982). “Homeopathy (Samuel Hahnemann)”. Pielȩgniarka i połozna (in Polish) (4–5): 16–17. PMID 6750668. Habacher, M. (1980). “Homöopathische Fernbehandlung durch Samuel Hahnemann”. Medizinhistorisches Journal (in German). 15 (4): 385–391. PMID 11610925. Antall, J.; Kapronczay, K. (1973). “Samuel Hahnemann”. Orvosi hetilap. 114 (32): 1945–1947. PMID 4581537. Hodges, P. C. (1964). “Homeopathy and Christian Friedrich Samuel Hahnemann”. Postgraduate Medicine. 35: 666–668. doi:10.1080/00325481.1964.11695164. PMID 14143315. Dietrich, H. J. (1958). “Hahnemann’s capacity for greatness; Samuel Hahnemann; and Hahnemann Medical College”. The Hahnemannian. 93 (2): 35–39. PMID 13562700. Koch, E. (1955). “On the 200th anniversary of Dr. Samuel Hahnemann; several ideas concerning homeopathy”. Das Deutsche Gesundheitswesen (in German). 10 (16): 585–590. PMID 14379841. Auster, F. (1955). “200th Anniversary of the birth of Dr. Samuel Hahnemann, born April 10, 1755”. Pharmazeutische Zentralhalle für Deutschland (in German). 94 (4): 124–128. PMID 14384489. “Hahnemann, Samuel Christian Friedrich” . The American Cyclopædia. 1879.